The Department of Education announced yesterday during a ceremony at Kailua Intermediate School that Pascale Pinner, an eighth-grade science teacher at Hilo Intermediate School, was named Hawaii's Teacher of the Year. 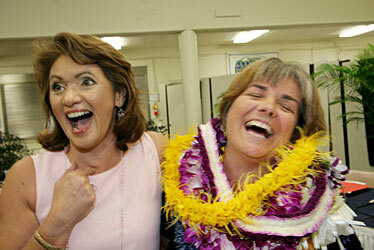 Elaine Christian, left, principal at Hilo Intermediate School, and Pinner celebrated the award. To grab her students' attention in a lesson about atoms and electricity, science teacher Pascale Pinner came up with a song, "The Atoms' Family." "You have to vary how you teach things to kids," said Pinner, who teaches eighth-graders at Hilo Intermediate School. "You need to have that ability to stand up, move around, sing, dance. That's important." For her creativity, energy and enthusiasm, Pinner, a 45-year-old Canadian woman, was named State Teacher of the Year yesterday at a Board of Education meeting at Kailua Intermediate. She was selected from seven District Teachers of the Year. "Her students engage in service learning from surf to sky," said Schools Superintendent Pat Hamamoto, "with beach cleanups and environmental and astrological exploration of the slopes of Mauna Kea." Pinner, who has been at Hilo Intermediate for almost 20 years, credits her parents -- a mother passionate about music and geography and a father hooked on electrical engineering -- for sparking in her a "deep curiosity for how things work." "My parents never graduated from high school, but they always infused massive amounts of learning in our lives, all the time," said Pinner, her face poking out from a pile of purple, white and yellow leis. Hilo Intermediate Principal Elaine Christian, who had Pinner as a student in a speech class while teaching at the University of Hawaii at Hilo, said Pinner's energy never faded, even after the first challenging years in the classroom. "She became a good friend, then she was my daughter's teacher at Hilo Intermediate," Christian said. "She has a belief in kids that they will, that they can." Pinner also was the student of Valerie Takata, the complex-area superintendent for Hilo, Laupahoehoe and Waiakea, while in the teacher education program at UH-Hilo. "She was a shining star," Takata said. "She's always shining brighter." As part of her prize, which includes $1,500, Pinner received a one-year lease on a new Mazda, donated by the Hawaii Automobile Dealers Association, and about $25,000 worth of teaching materials. Pinner, who won the national Presidential Award for Excellence in science teaching in 2004, has a bachelor's degree in biology, and basic and professional certificates in secondary education from UH-Hilo. She will use the money from her award to pay for her doctorate in teacher leadership at Northcentral University in Arizona.